Our main focus is the production of house dust mites (HDMs) and their allergens. Dermatophagoides farinae belongs to the Pyroglyphidae family. Dermatophagoides farinae is the second most important house dust mite (HDM) next to D. pteronyssinus. We deliver the D. farinae HDM in different forms. The most popular form is the regular HDM extract but we can also deliver whole cultures, purified allergens (Der f 1/ Der f 2), excrements and mite bodies. Extract Our HDM extract is our most popular product. Extracts are applied in in-vitro diagnostics tests and as standards or active substance in the research of asthma and allergy. Extracts are available in vials of 10 mg, 100 mg or 1 gram. Whole culture A whole culture consist of all the material of the house dust mite cultivation. This means: mite bodies, eggs, larves, cultivation medium and the feaces. Whole culture contains all components which are also present within households. In real life, atopic patients respond to the whole culture of house dust mites. 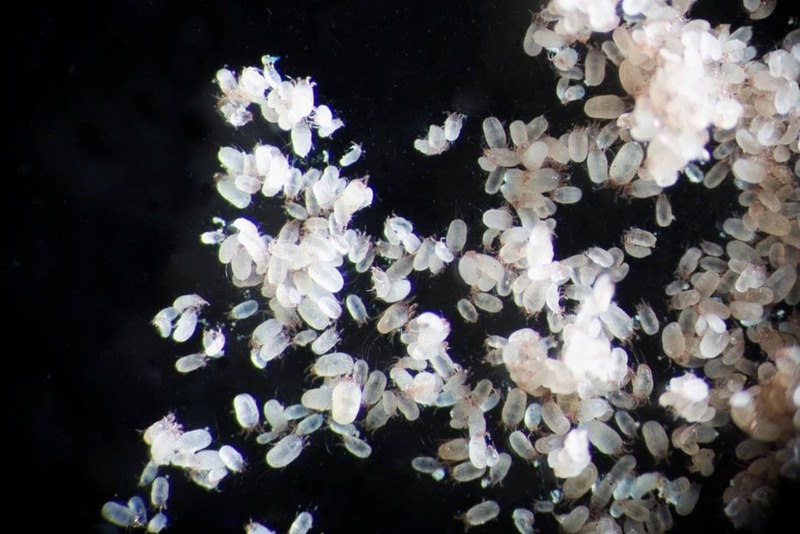 Citeq produces a controlled cultivation of house dust mites. 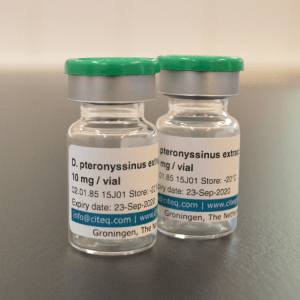 Whole Cultures of Dermatophagoides farinae are mostly used as raw materials in the pharmaceutical production of vaccines and in vivo diagnostics. Available in vials of 1 gram. Der f 1 purified (≥ 95%) Approx. 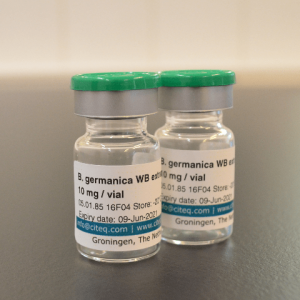 900-1100 µg BCA per vial. Group 1 (Der f 1) allergens have a molecular weight of 25 kDa, as monomer, neutral slightly acidic, and polymorph proteins. Citeq can extract the Group 1 allergens with a purity of ≥ 98%. At least 70% of allergic individuals recognize group 1 allergens. These allergens are identified in a lot of house dust mites (HDM). The allergens can be conceded through the whole body, but are mostly present in the feacel pellets of the HDM. The major allergen Der f 1 is mostly used in in-vitro diagnostic tests and in allergy and asthma research. Der f 2 purified (≥ 95%) Approx. 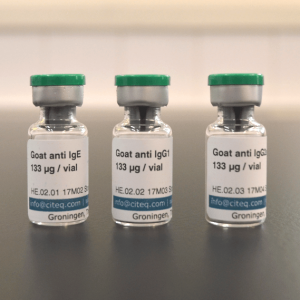 100-300 µg BCA per vial. Group 2 (Der f 2) allergens are neutral to slightly basic and polymorph. Citeq can extract the Group 2 allergens with a purity of ≥ 98%. The majority of allergic individuals recognize the 14kDa non-glycosylated allergens. Group 2 allergens are identified in a large number of HDM’s compared to other allergens. Group 2 allergens are abundantly present within the mite body. The major allergen Der f 2 is mostly used in in-vitro diagnostic tests and in allergy and asthma research. Excrements House dust mite excrements are considered the main source of allergy. 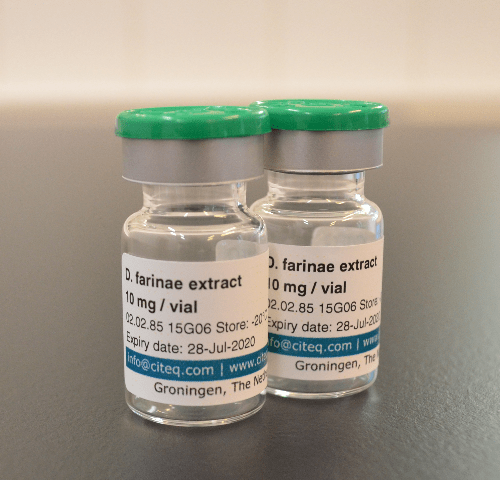 We deliver the D. farinae excrements in vials of 1 mg.
Mite bodies The Mite bodies are produced by separating the living mites from the growth medium. This is done by physical separation methods. 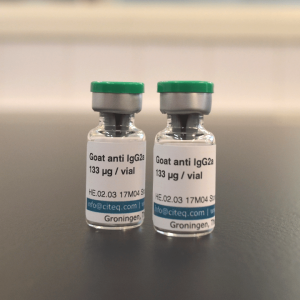 Our mite bodies are available in vials of 1 gram. HDM mix A mix of the D. farinae and D. pteronyssinus extract. Available in vials of 10 mg, 100 mg or 1 gram. Extract with a low level of endotoxin This is the same extract as our regular extract but with a low level of endotoxin. You can add the product of choice to your quote request. Just choose the form you want and click on the “add to quote” button at the beginning of this page (no registration needed). We will contact you as soon as possible. Off course you can also send us an e-mail or give us a call. Der f 1 purified (≥ 98%) Approx. 400-500 µg BCA per vial. Group 1 (Der f 1) allergens have a molecular weight of 25 kDa, as monomer, neutral slightly acidic, and polymorph proteins. Citeq can extract the Group 1 allergens with a purity of ≥ 98%. At least 70% of allergic individuals recognize group 1 allergens. These allergens are identified in a lot of house dust mites (HDM). The allergens can be conceded through the whole body, but are mostly present in the feacel pellets of the HDM. The major allergen Der f 1 is mostly used in in-vitro diagnostic tests and in allergy and asthma research. Der f 2 purified (≥ 98%) Approx. 200-300 µg BCA per vial. Group 2 (Der f 2) allergens are neutral to slightly basic and polymorph. Citeq can extract the Group 2 allergens with a purity of ≥ 98%. The majority of allergic individuals recognize the 14kDa non-glycosylated allergens. Group 2 allergens are identified in a large number of HDM’s compared to other allergens. Group 2 allergens are abundantly present within the mite body. The major allergen Der f 2 is mostly used in in-vitro diagnostic tests and in allergy and asthma research. Extract of whole culture (vials of 10mg, 100mg or 1gr) Whole culture which is extracted. Extracts are applied in in-vitro diagnostics tests and as standards or active substance in the research of asthma and allergy.